Character: What's No. 1 American character strength? Posted on Fri, Feb 17, 2012 : 7:51 p.m.
Editor's note: This post is part of a series by Dr. Baker on Our Values about core American values. This week, Dr. Baker is relying on a global survey to discuss America's character strengths, along with its weaknesses. Searching for the American character? We’re all searching. The quest to define "our" character is a major part of American culture. 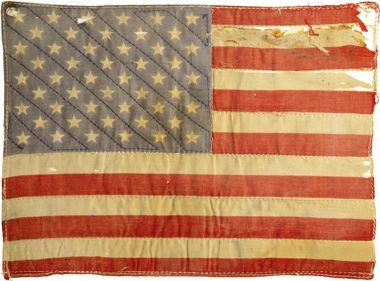 This flag patch (above) is the one that Peter Fonda wore on the back of his jacket in 'Easy Rider.' The patch sold at auction for $90,000 in 2007. Quick: What’s the top American character strength? What is a character strength? It’s a type of virtue that a person — or a culture — can hold to a greater or lesser degree. Defining and strengthening our national character has been a central theme in American life and culture since the founding of our nation centuries ago. Right now, the goal of strengthening American character is a major theme on the campaign trail. Politicians cite the decline of American character and values as the culprits behind many social and economic problems. But how true is it? We know from research I've reported before on ourValues.org that Americans share a set of core American values. These values haven't been lost. But, how about American character strengths? We know the answer to these questions from a global survey of character strengths reported by psychologists Nansoon Park, Chris Peterson and Martin Seligman. These researchers developed a survey of 24 strengths that represent six universal virtues: wisdom and knowledge, courage, humanity, justice, temperance and transcendence. More than 100,000 people from 54 nations took the survey, including Americans in all 50 states. The top character strength in America is: kindness. It's one of the strengths associated with the virtue of humanity — interpersonal strengths that involve helping, taking core of, and befriending others. Are you surprised? What surprised me was that kindness was not the top strength anywhere else. Among the 54 nations included in the survey, it was only in America that kindness took the top spot. Do you see kindness as a prevalent character strength in America? What are strengths do you see? Please add a comment below, and "like" us on Facebook! Mon, Feb 20, 2012 : 1:57 p.m. I am, actually, surprised that kindness ranked so high, but I'm glad people have this in mind. I always find that kindness is undervalued. I value smarts and innovation and ambition, but in a best friend? Kindness would be near or at the top of my list of character traits.